Summary: As Jawn continues his exploration of downtown residences, a podcast at the pristine Pennsylvanian, to take a peek, was only fit….and because we have been chomping at the bit to see Chancellor Humphrey’s new studio and chat about his success as a photographer and personality on 100.7 STAR. We welcome the band FUBAR, returners to the YaJagoff Podcast, to talk about the latest and greatest places to perform in Pittsburgh. Listen to the podcast while you hang out by clicking the PLAY BUTTON on the play bar below. If you don’t see the Play Bar in your email, above, click the one below to listen while you work or wash your car! SPONSOR: Total Sports Enterprises will be at Shear Da Beard with one of our favorite grid iron greats, Brett Kiesel. His annual beard shaving to benefit Children’s Hospital happens on Feb. 15th at Jergels. Join past and present Steelers, as well as Total Sports Enterprises to give back to the hospital that gives so much. Support the TSE silent auction and you are supporting the needs of hundreds of children at our renowned hospital. Brett will give his beard to give back and so can we. See you at Shear Da Beard and visit tseshop.com for all of your auction options. Question of the day: Longer winter or spring is in the air? 5:34 Chancellor Humphrey: Chancellor, social media influencer and 100.7 STAR radio personality, joins the podcast fully loaded with his professional accomplishments. His talents have become full-circled with his personal touch in photography for Keep Pittsburgh Dope, becoming a social media influencer for The Pennsylvanian while being a DJ on 100.7 STAR during his weekend schedule. His personable charm fueled by his creative lifestyle certainly drives his career to new heights, quite literally, while living in the iconic Pennsylvanian. 19:51 FUBAR: FUBAR jams out in The Pennsylvanian lobby while discussing their new music and upcoming shows. Composed of four gentlemen by the names of Dave, Jake, Matt, and Jordan, FUBAR focuses on reggae and punk tones with a rock and roll twist. The band will certainly entice people’s eardrums, and their new song, “Everybody” is featured on their new album, ‘The Hunt for Inspiration.’ Find out which singer in the band found his vocal talent by playing an actual donkey in his younger years! 29:51 NEW!! Moat’s Notes with THEEEE Arthur Moats. 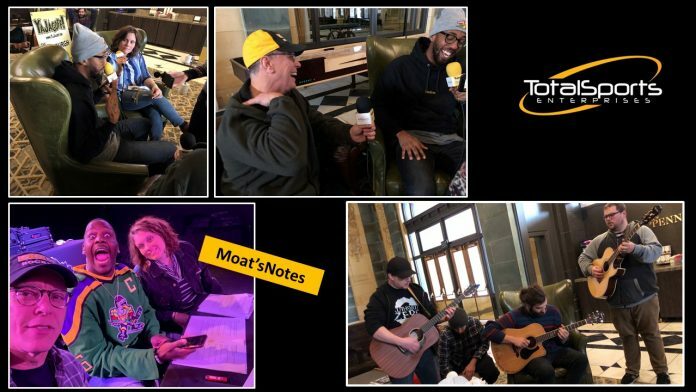 This is our first segment of Moat’s Notes and Arthur Da Body Moats tells you 5 places he would take a train to experience! Previous articleJust Here To Help? Well Now! Can This Guy Borrow Your Truck?